Blogs Archives - Page 2 of 9 - Mentor Europe status (ChPP) - the first of its kind in the world. The Chartered Project Professional (ChPP) standard is “a professional benchmark that demonstrates attainment of a defined level of technical knowledge, professional practice and ethical behaviour". “As of today, project management takes its rightful place at the table alongside other professions including accountancy, engineering and medicine. It is our belief that chartership will help to raise standards and employability while addressing a growing demand for project professionals. Chartership will enable project professionals to have an increasingly positive impact on society and the economy by helping to ensure a world in which all projects succeed”. Does this mean program success stories will soar? With around 70% of programs failing, it’s certainly a step in the right direction – but will it put much of a dent in the woeful flop statistics any time soon? Thirty years ago, I left corporate life in Telecoms and IT to launch Mentor because I believed there was a much better way to run complex projects and programs. We have proven there is a better way at Mentor – time after time. We have never had a single client program nosedive. In the past, I had seen lots of programs live through serious delays, massive cost overruns and not deliver what the customer wanted or expected. A handful were dumped completely at enormous expense and reputational damage - for reasons that were absolutely unnecessary. I was once sent to the USA to 'fix' one of these sick programs and, if you’ve had an experience like that, you never want to repeat it. Unless you are insane. We had Project Management process models, naturally. Plenty of them – written by theorists - and all rooted in the ‘theory’ of project management. But there were always other problems - external to the process model - causing programs to head for Burn-Out town, like a bullet train. Technical knowledge, professional practice or so-called ethical behaviour is essential. But they were rarely the cause of a program going into a tailspin. Problems were always linked to management behaviours in different functions across the business. We always had ‘agreement’ on what needed to be done at an abstract level – which people across the organisation twisted to suit their own agenda and talked about with splendid eloquence. But when it came to interpreting what the ‘abstract agreement’ meant to different functions, philosophical ‘fractures’ appeared. And some of these fractures – like those that routinely occur between marketing and product development - never got resolved during the life of a project. Sometimes functions displayed open hostility to each other. On other occasions, it was passive resistance. But open hostility is much easier to handle. If you work in a company where the culture is political and fear-driven, it’s extremely difficult to flush out these issues without being bayoneted a few times. If you’ve been bayoneted even once, it acts as positive deterrent from speaking out – and ethics go out of the window. Many programs also failed because the inter-dependencies between different functions and different projects weren’t managed properly – or even identified. I understood how these damaging ‘disconnects’ and management blind spots came about. They’ve been around since the time of the Pharaohs. But, more importantly, I knew how they could be avoided. And that’s why I launched Mentor. With 3 solid decades of deep frontline management experience, Mentor has built an incredibly talented team of skilled practitioners, who have worked on all sorts of programs in the UK and European telecoms space. And, on International Project Management Day, I can’t help but look back on some of the huge successful projects, programs and portfolio’s Mentor has worked on with companies like O2, Three, Energis, EE, Dell, Cable & Wireless, BT, ICO, Iridium, Arqiva – and so on. We’ve worked behind the scenes on greenfield start-ups; near-to-launch businesses; and for some of the biggest TMT companies - to accelerate business-critical programs, involving thousands of people and hundreds of millions of pounds in investments and delivery resource. But a few ‘experiences’ are never enough. You need many and frequent experiences to really tough time-critical challenges to build the kind of wisdom Mentor has today. We have always been able to hit the ground running and make an immediate contribution to every program. To people that know us, we don’t write reports to tell you what you already know. We roll our sleeves up and work alongside your people to get the job done. And with the kind of wisdom we have, comes a unique level of insight into the types of programs in telecoms that will have a colossal impact on the industry in the future. And right now, that’s 5G. 2G, 3G and 4G were a stroll in the park compared to the challenges and opportunities 5G presents. This is why we’re so heavily involved in helping to make sure the UK positions itself for 5G leadership – and why we put so much effort into working with different organisations across the value chain to help make sure this happens. But 5G is a ‘fat’ expression. It means many things to different people. What does it mean for telcos? Right now, it means investing huge sums on networks that allow the entire sector to function. There have been huge year-on-year traffic increases on networks – up to 50 per cent, but fundamentally telcos have not converted this increase into revenue growth. Infrastructure is absolutely crucial – that’s true. But many other programs are required to tackle newer and more profitable opportunities elsewhere in the value chain. Otherwise the industry is destined to miss the 5G-type opportunity that it let escape on 4G – and simply become a commoditised utility. 5G is a real growth prospect for telcos who need to move quickly to get the most out of this mega-business opportunity. SIM cards with low ARPUs are manifestly not the answer. 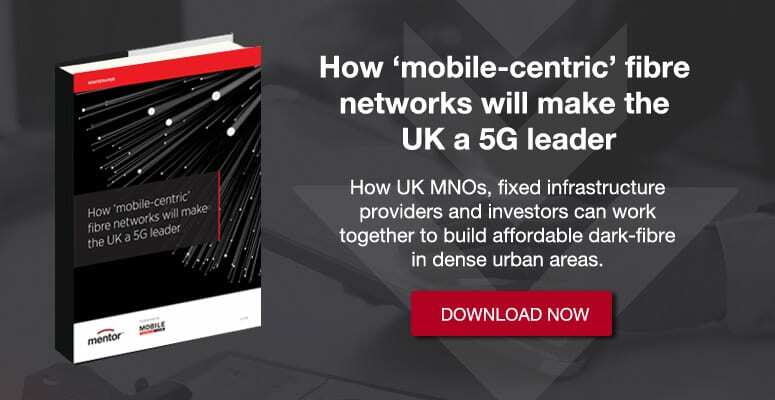 Preparing for 5G implies a massive set of new programs that will significantly change the telecoms landscape in the UK from anything that has come before it. Most of these programs will demand a ‘hole-in-one’ mentality. Get it right first time. No trainees. No false starts. Program leaders for these 5G market openings must be intimately familiar with the telecoms landscape. Naturally, they should have a “defined level of technical knowledge, professional practice and ethical behaviour” but, of itself, that won’t be nearly enough. ‘Wisdom’ that comes from having had relentless exposure to the tempo of business-critical programs will be the only entry card to guarantee the sort of results telcos need. Can Openreach build Full Fibre faster than anyone else? Can Ofcom get its ducts in a row? Copyright © 2019 Mentor Europe Associates Ltd. All rights reserved. This website stores cookies on your computer. These cookies are used to collect information about how you interact with our website and allow us to remember you. We use this information in order to improve and customise your browsing experience and to personalize ads and for analytics and metrics about our visitors both on this website and other media.